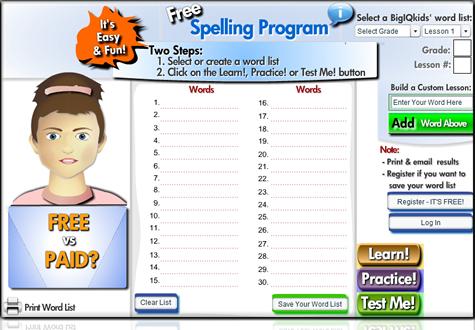 SpellingTime.com is a FREE virtual spelling tutor that presents quizzes, spelling bees, spelling tests, and fun spelling games all customized to each child’s abilities. Our students score 100% on every spelling test! New - FREE Online Spelling Program! Allows both mouse or keyboard input - Improves typing! Teaching avatars provide your child with their own virtual spelling tutor. ©2010 Synergy1 Group Inc., All Rights Reserved.